Vic learns that his fiancée is being stalked, Guys dreams of a 19th-century murder, and the connection between their twisted tales leads to a shocking surprise involving reincarnation. Bestselling author James Kahn - doctor, writer, and musician - has worked with celebrated filmmaker Steven Spielberg, Star Wars creator George Lucas, and renowned sci-fi editor Judy Lynn Del Rey. Not only do his fiction credits include the movie tie-ins for Return of the Jedi (on The New York Times bestsellers list for months), Indiana Jones and the Temple of Doom, The Goonies, and Poltergeist, he's also written for such television shows as Star Trek: Voyager and Xena: Warrior Princess. I don't know how to describe this book without using words you see printed on the front of all thrillers; gripping, action packed, intense. Somehow simply using words like that after seeing them so many times feels like taking the easy way out in spite of the fact those words accurately describe Incarnate. 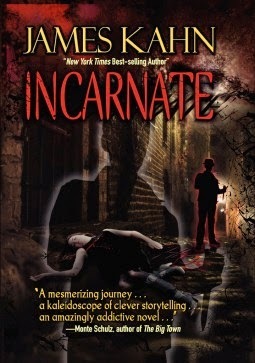 I requested this upon seeing the word reincarnation, a favourite of mine, and loved how the plot twisted it about. Reincarnation was there, but it wasn’t a book about reincarnation. Just like it had the theatre without being about the theatre and plenty of great medical detail without being a medical thriller. The characters were well placed in the story, each strong and relatable. Whether I felt they were good or bad, they earned those feelings from me. Kahn lures you in, as I’ve found in his other works as well, so deeply that when the plot releases a big moment your senses are wide open. So many big revelations, ‘bad things’ and oh my God surprises gave me cause to flinch inside and reread the passage to relive the moment again. Many thanks to the publisher for the opportunity to experience this book.